Sidestrand is a small parish on the north Norfolk coast, some 4km along the coast to the east of Cromer. 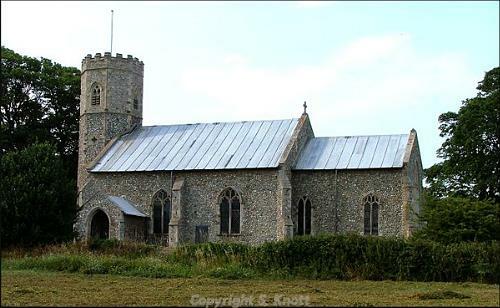 The parish itself has a long coastline of dramatic cliffs and the line from Sidestrand to Trimingham, the neighbouring parish to the east, is one of the wildest parts of the Norfolk coast. The name ‘Sidestrand’ is thought to derive from the Old English for wide shore. Probably as a result of this geology and site, Sidestrand is endowed with a high number of objects from the earliest periods of human history, including worked flints (NHER 6773, NHER 6779, NHER 6778), a number of handaxes (NHER 6774, NHER 6775, NHER 6776, NHER 6777, NHER 6801), and a Neolithic leaf arrowhead (NHER 6781). In addition to this there are a small number of features of possible prehistoric date, including an undated ring ditch (NHER 38880) situated on the coast near to the sea, as well as two possible Iron Age or Roman field systems (NHER 38895, NHER 38509) situated to the south and overlapping into Southrepps parish. However, there have been no objects from the Bronze or Iron Age periods recovered, and only a fragment of quern (NHER 15384) from the Roman period. No objects have been recovered from the Saxon period; medieval finds are limited to some pottery sherds (NHER 6782) and the remains of a worn cauldron (NHER 24347), and from the post medieval period only the fragments of some 19th century shoes (NHER 40921) have been recovered. However, this is likely to be indicative of a lack of field walking or metal detector activity in this parish, rather than any intrinsic lack of occupation during these periods, particularly in light of the fact that Sidestrand is recorded in the Domesday Book. It should also be noted that coastal erosion has long been a problem for this area of the coast, and indeed the original medieval St Michael’s Church (NHER 6797) was demolished and rebuilt further inland (NHER 6803) before the site was lost to the sea in 1916. It is therefore possible that the majority of the evidence for occupation in Sidestrand now lies beneath the sea. Due to a careful reconstruction using many of the original building materials, the modern day St Michael’s Church (NHER 6803) appears to be a late medieval church, although it is in fact a copy of the original church. Most of the south porch is derived from the original, as well as the Perpendicular style chancel arch and the 15th century cross in the nave’s east wall. Also possibly dating to the medieval or post medieval period is a complex set of cropmarks situated at the very west of the parish, which may consist of field boundaries, ditches and a trackway. Other post medieval features include a possible ship wreck (NHER 38974) which can be seen in the intertidal zone, as well as a number of possible post medieval trackways (NHER 38879). These are situated just below Ivy Farm Cottages (NHER 13439), along with a flint and brick building which was originally built in the 16th or 17th century and which retains several original doors and frames. Another building of interest is Bizewell on the Trimingham Road, a 19th century flint and brick building on the site of an earlier timber-framed house that is situated on the parish boundary. Similarly Garden Close, a 19th century house with an earlier core, has also been listed by English Heritage. From the more recent past, the line of the Norfolk and Suffolk Join Railway (Northern Section) (NHER 13585) also ran through Sidestrand, stopping just over the parish border in Trimingham. A number of features survive, including banks to the south of the parish. Due to the long stretch coast, Sidestrand has thirteen recorded World War Two defensive sites. These include a large number of pillboxes (NHER 38878, NHER 38881, NHER 38976), as well as trenches and weapons pits (NHER 38971), gun emplacements (NHER 38973, NHER 38972, NHER 38978), and a searchlight (NHER 38967). The vast majority of these have been recorded from aerial photographs taken by the RAF during and just after World War Two. Ruth Fillery-Travis (NLA), 3rd April 2007.